Imelda May kicked off a night of Rock-A-Billy shimmy and shake at Central Park Stage on July 27, 2011. See the full story here. It has always been a treat to see producer Daniel Lanois do his thing on stage during the years since the release of his first album “Arcadie”. I’ve been lucky enough to hear him perform at The Bottom Line back around the time of that first album and more recently at an excellent WFUV songwriter series at Carnegie Hall’s intimate Zenkel Theater. In this case Dan’s NYC appearance was to introduce a new project called Black Dub. Black Dub is Lanois in collaboration with longtime foil Brian Blade on drums, multi-instrumentalist/vocalist Trixie Whitley, and on this show Bassist Chris Thomas filling in for usual cohort Daryl Johnson. For those not familiar with Lanois himself, it is likely you are more than familiar with the music he has helped to create as a record producer. His work with Brian Eno and U2, beginning with the transitional “The Unforgettable Fire” album, led – arguably – to their career highs, “Joshua Tree” and “Achtung Baby”. He manned the board for Peter Gabriel co-producing “So”, has worked with Bob Dylan twice and produced “Wrecking Ball” a savvy, career defining CD for Emmylou Harris. Some of my favorite work, including “Somewhere Down The Lazy River”, appears on the first solo album of his fellow Canadian transplant Robbie Robertson. Though no opening act was listed, that space was essentially occupied by a video loop of images associated with Lanois’ “Omni Series” CD’s which unfortunately went on just a wee bit too long. Though many of the images were compelling, particularly an eery visual of Dan at the pedal steel with sound waves emanating around him, it didn’t stand up to its half hour long airing. From my vantage point in the balcony it was clear the fidgeting and muttering audience was getting quite restless after the repetitive presentation kicked in for the third time. Most of the attendees were polite but there were a few who were vocal about their displeasure. I‘m always interested in the experimental edge of the artists I follow – Dan especially, it’s part of his ethos and allure – but we got the point of the video the first time through. I don’t think I’m stretching the imagination to say that the crowd would have preferred an additional 10 minutes of Dan on the pedal steel improvising to the video. It was an unfortunate miscalculation that put a weird spin on the start of the show and it took the band a few tunes to warm up an audience that had already been worn out. In the setting of Black Dub Lanois is less the front man and more like an amiable godfather or even “mid-wife” in the proceedings. Its very much an egalitarian effort, a nice tasty musical soup that relies on each player’s intuitive response to the other. Brian is a great technician but never serves technique over feel. He always seems to find completely unexpected fills that fit the mood perfectly. Trixie’s ability to switch instruments – alternating guitar, drums and keyboard – aids greatly in their ability to morph the mood throughout the set. Though Trixie didn’t perform her single, the Etta James classic “I Would Rather Go Blind”, any disappointment was quelled by the inclusion of a new bluesy Black Dub original called “Surely You Were Meant To Be Mine”, which conjures up Stax style gospel soul. It is a little gem waiting to be polished up in the studio and could easily be imagined with an “I’ve Been Loving You Too Long” inspired horn section added. This is a grand slam, a killer tune. Another high point, “Silverado”, found Brian sitting on the floor behind his drum kit engrossed in Dan and Trixie’s beautiful harmonies. Dan carried the song along with rolling guitar crescendoes and it was a very intimate performance to a hushed crowd. Brian and Chris Thomas have a history of work together in the Brian Blade Fellowship and they were locked together in groove-land throughout the night. Chris was smiling broadly, having a great time syncing with Brian, pounding his bass and adding background vocals. I only wish Brian was not sequestered away in the corner of the stage because such a large part of the audience was there to see him. He got an uproarious ovation when introduced. On stage, weaving himself between the instruments and amps, videographer Adam Vorlick wielded a single camera. Its black & white output was broadcast on the screen behind the band and was also being webcast live across the planet. He did an excellent job of highlighting the group member’s interplay and expanding the show’s visual scope for the Bowery audience. His performance on the camera became an integral part of the show, much in contrast with the canned feel of video broadcast to jumbo-trons at stadium events; a nice touch that elevated the musical experience. No Lanois show can be without a performance of fan favorite and signature tune “The Maker”. It’s been covered by Emmylou Harris and Willie Nelson on albums that Dan produced for them but it is his recording on “Arcadie” that is the benchmark. The double bass guitar track is a key feature of its appeal and hard to reproduce onstage. Black Dub slid into it tentatively but found the pocket during the first verse with Trixie joining the rhythm section on a second set of drums. They ended tight with the song’s powerful coda/refrain “Oh, river rise to the sea”. I’d love to see the dual drum aspect of Black Dub exploited more as it coalesces. A flat out percussion jam would be so right for this band. My favorite performance of the evening was set closer “Ring the Alarm”, the only nod to Jamaican “dub” that Black Dub ventured.It was a nice opportunity for the band to stretch out, jam, and harmonize on its chanted lyric “ring the alarm, another sound is dying – hey -oh”. The encore included Dan and Brian laying down a quiet atmospheric guitar piece evoking his “Joshua Tree” era desert-scapes. All together a good showing by a band that is still incubating but has the cojones to do it live in front of an audience. I’m truly looking forward to the upcoming album (set for spring release) and the next live show. In the meantime you can catch a lot of video of Black Dub on the official Daniel Lanois website. Check out my review and Ken Pierce’s photos of The Who’s Roger Daltrey during his “Use It or Lose It” tour in November 2009 at Nokia Theater, NYC by clicking this link. What a treat. An awesome double shot surprise for the second of three “Season of (Johnny) Winter” Mondays at BB King’s in NYC. 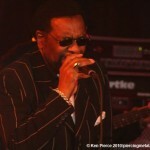 This time the opening act was the great singer songwriter William Bell. On this gig his back-up band was headed by former Saturday Night Live band leader, guitarist G.E. Smith, with the addition of the Uptown Horns. It was a perfect soul revue staging that allowed Mr. Bell to explore the full range of his smooth but powerful voice, even in their too short stint on stage. Though Bell did not enjoy the high profile of soul cross-over artists like Wilson Picket and Otis Redding, as one of the earliest recording artists on the Stax Records label he became a seminal figure in the creation of the southern soul sound. His key song “You Don’t Miss Your Water” (which he wrote and recorded as a teenager in 1961) continues to be a blueprint for gospel tinged, organ driven & muted horn R&B. While my favorite interpretation of the song was recorded by Brian Eno and John Cale on their “Wrong Way Up” album it was most notably covered by the Byrds during Graham Parson’s time in the group. It is no surprise that the G. E. Smith led backing band was so perfectly attuned with Bell since the elegiac ending music SNL used throughout Smith’s tenure was solidly based on “You Don’t Miss your Water’s” feel. 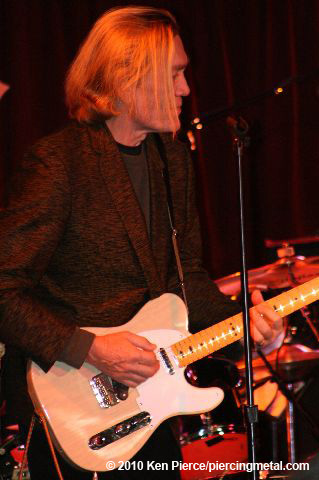 Mr. Bell is also co-author of a cornerstone of electric blues “Born Under a Bad Sign”. Originally written with Booker T. Jones for inclusion on the Albert King album of the same name, the song found its way into late 1960’s pop culture when it was covered by Cream. Much to the amusement of the audience, Bell noted that the most recent cover version of the song was done by a newer pop icon, Homer Simpson. The tune was used as an opportunity to stretch out with individual members of the horn section getting a chance to shine and Mr. Smith accurately aiming a short but sweet solo featuring the stinging Telecaster sound he is noted for. Along with his own compositions, Mr. Bell peppered the set with snippets of well known soul sounds, including a bit of Otis Redding’s “Fa Fa Fa Fa (Sad Song)” and Ben E. King’s “Stand By Me”. Volumes have been written exploring how “Memphis Soul” evolved from the confluence of high lonesome country music, sanctified gospel and gut-bucket blues but if you truly want to understand its force you have to hear it done live. There are few better ways to experience the power of soul then spending an evening enraptured by the voice of Mr. Bell. Here’s hoping he will return to BB’s or maybe Highline Ballroom for a headlining show or two in the near future. To view more of Kenny Pierce’s photos and read his review of the night, including headliner Johnny Winter, please click this link.